Each restaurant inside Hotel MiraCosta has a different theme. 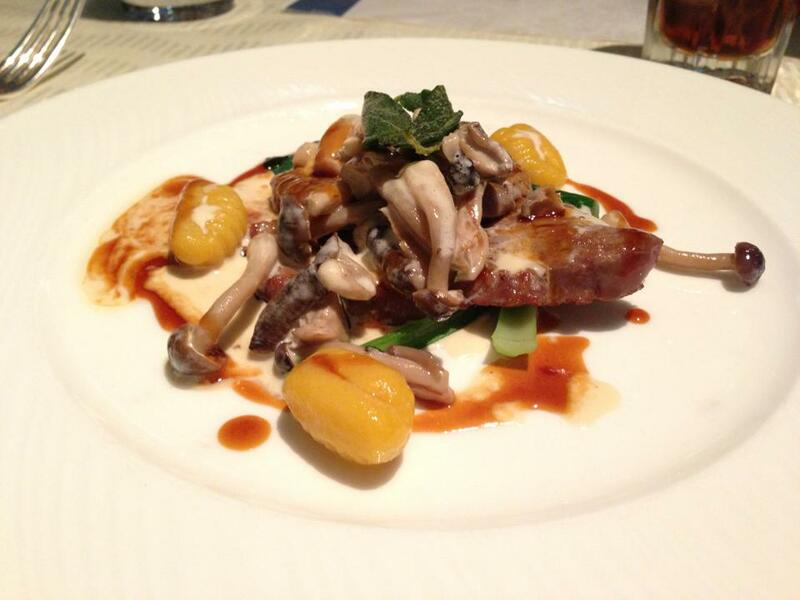 BellaVista Lounge is Italian, Silk Road Garden serves Chinese cuisine, and Oceano is Mediterranean influenced. 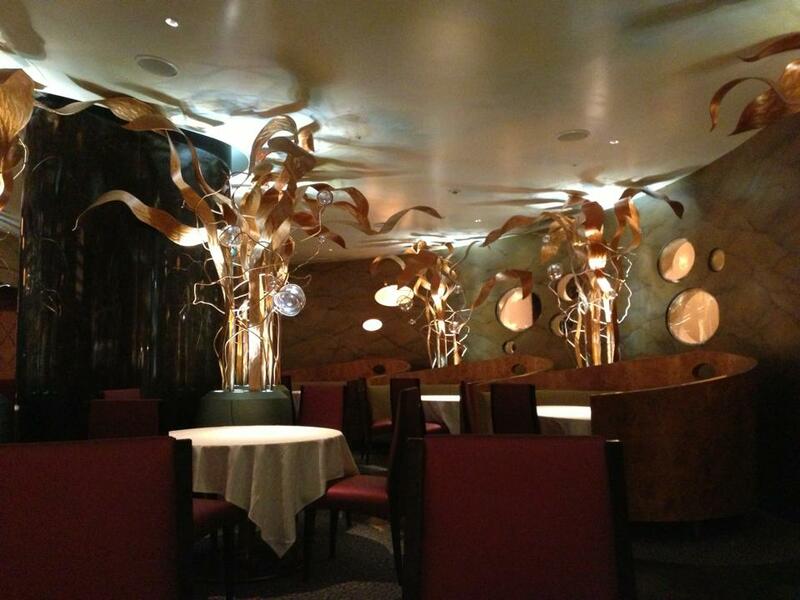 The restaurants are of course decorated to match the themes, with Oceano divided into two sections – the buffet area and the fine dining area (in the above photo). 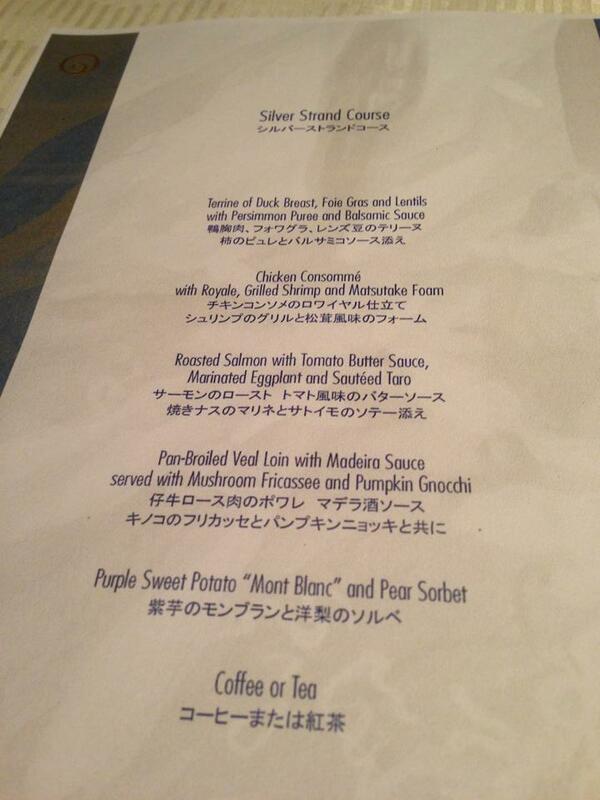 We ate dinner at Oceano in 2013 and tried two of the course menus, the Silver Strand Course, and the “Disney’s Halloween” Dinner Course. I’m going to start with the two menus, because the food was so fancy that it’s not immediately clear to me which dish was which when looking at the photos! They have menu books which include the prices, and they also hand you these single sheets of paper with the menu for the course you’ve ordered, so that you can (try to) keep track of what you’re eating, and you can take these home as a souvenir to remind you of what you ate. Very nice bread was unlimited, which is to be expected when you’re paying this much for a meal. They also topped up our drinks (we just had soft drinks and juice) throughout the meal. 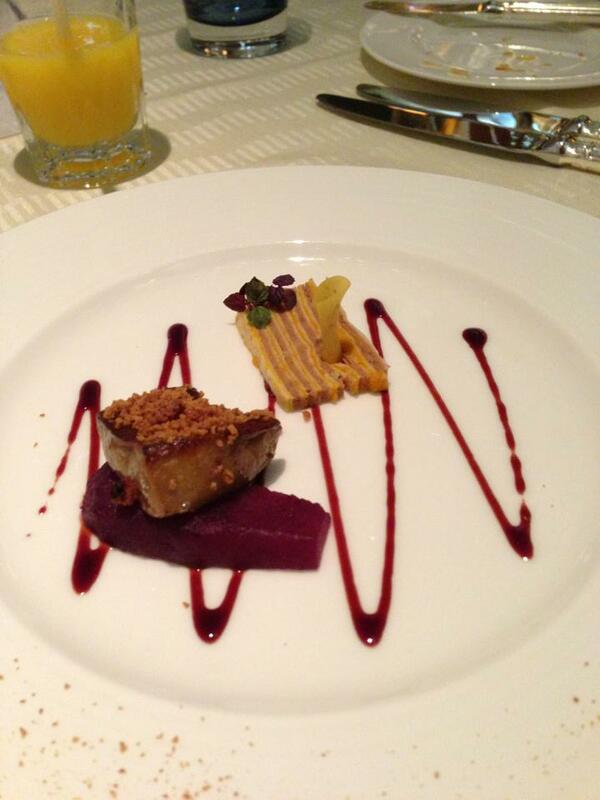 If you managed to figure out which entree was which, you’re doing better than me! Of course, everything was very good – if a little mysterious. From the Halloween menu – grilled wagyu fillet with anchovy red wine sauce, served with butternut squash and eggplant fondant, scented with shiso. From the Silver Strand Course – pan-broiled veal loin with Madeira sauce, served with mushroom fricassee and pumpkin gnocci. 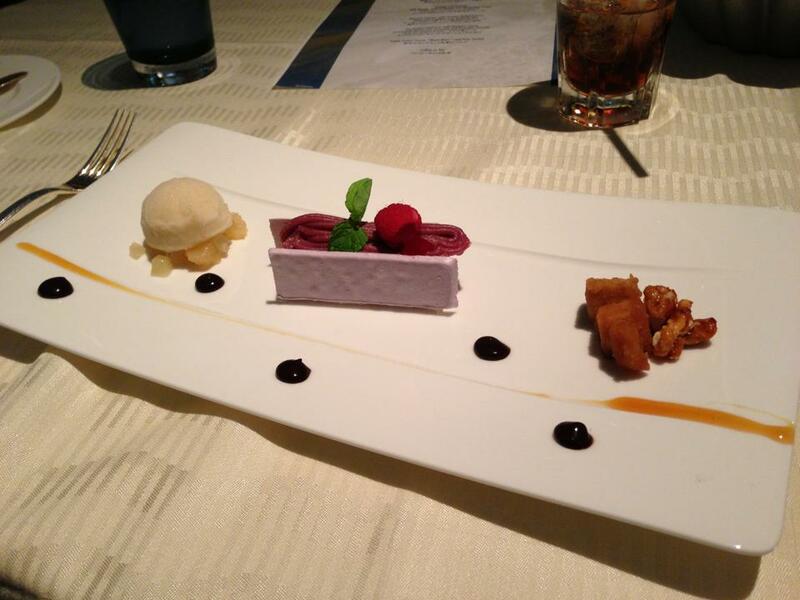 Silver Strand Course dessert – purple sweet potato “Mont Blanc” and pear sorbet. 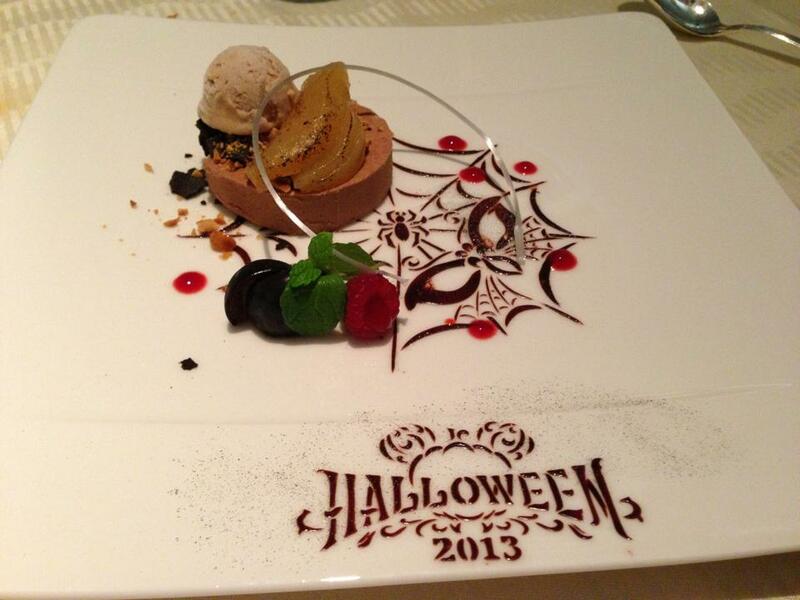 From “Disney’s Halloween” Dinner Course – a beautifully presented milk chocolate mousse and hazelnut ice-cream. The circular white decoration on top was made of candy, and even the “Halloween 2013” writing was edible (chocolate sauce). 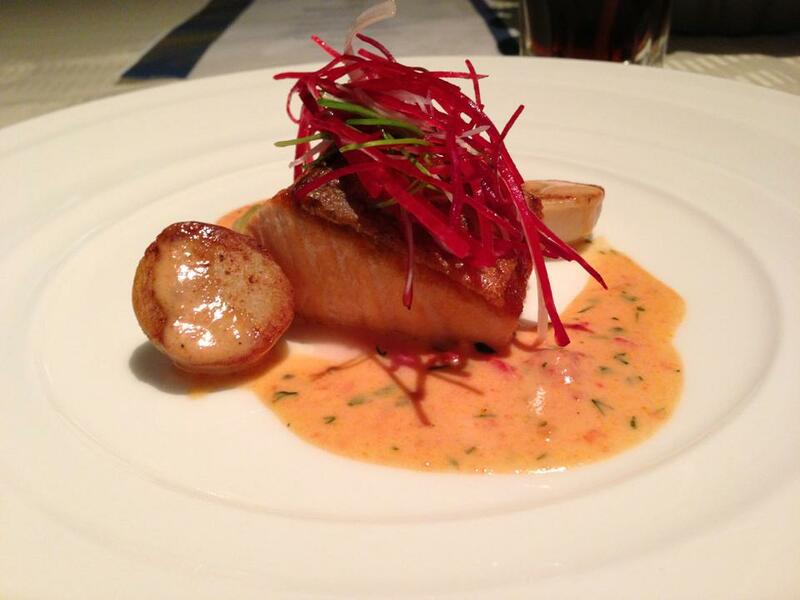 We booked a table at Oceano when we checked in our luggage at the Tokyo Disney Resort Welcome Center. However, it wasn’t busy at all when we went to the restaurant – at least, not in the fine dining section. 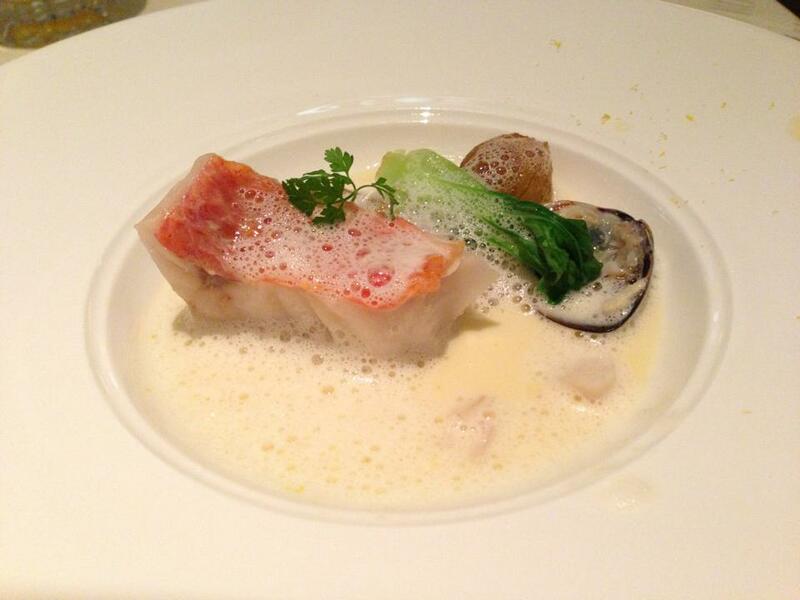 The service was – as you would expect anywhere at TDR – perfect. Please note that if you have any special dietary requirements, you may prefer to choose another option over one of the course menus. For example, I don’t eat duck or chicken, and as you can see from both of those menus, neither option entirely catered to this. We asked the staff whether they could change the meals for me, and – to my surprise – they did attempt to look into this (something which won’t often happen in Japan, even at TDR, as rules are rules and they don’t like to break them). 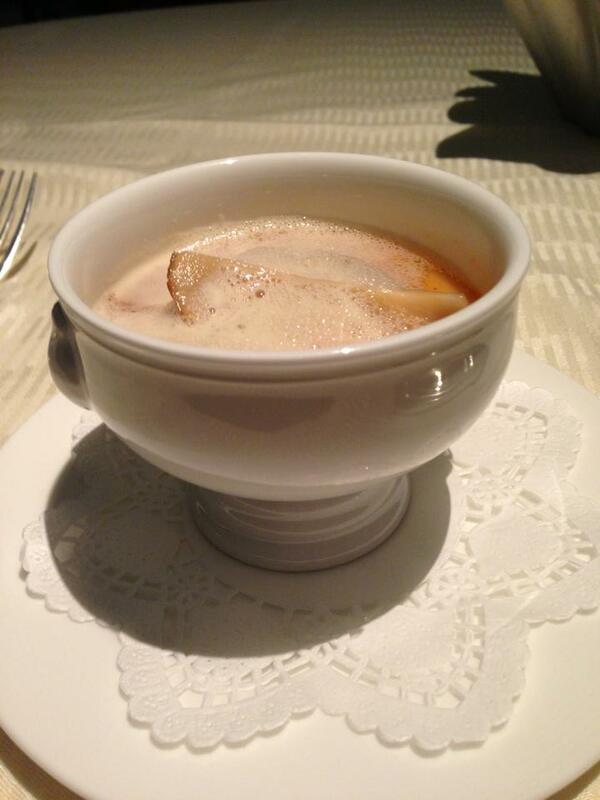 We ended up just going ahead with the two different course menus – my partner just got to try more dishes than I did – as in the end this seemed easier. 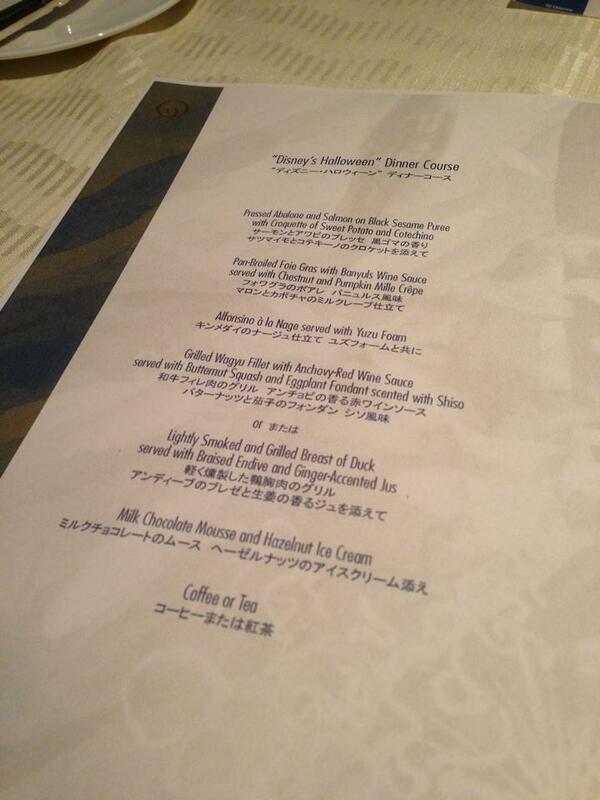 Each course menu was well above 5,000 Yen each, with the Halloween one being the most expensive. 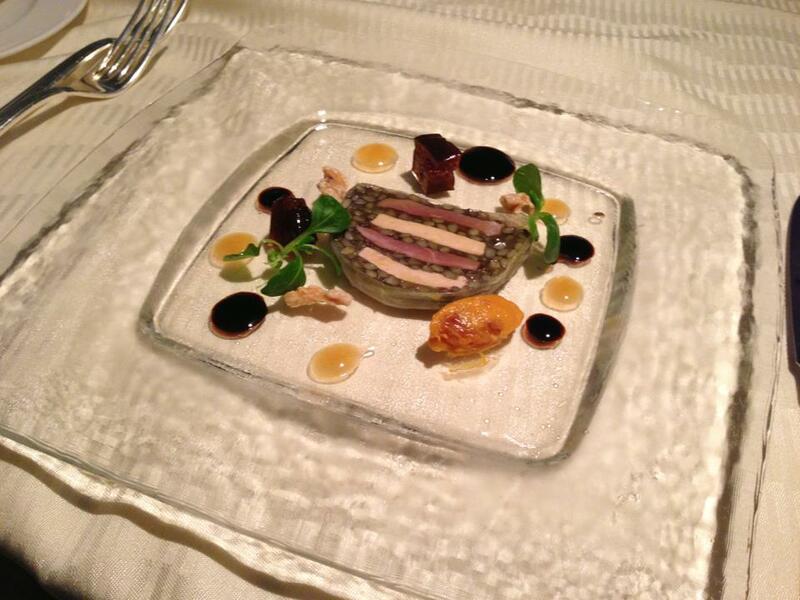 Oceano’s course menus are not a cheap meal! 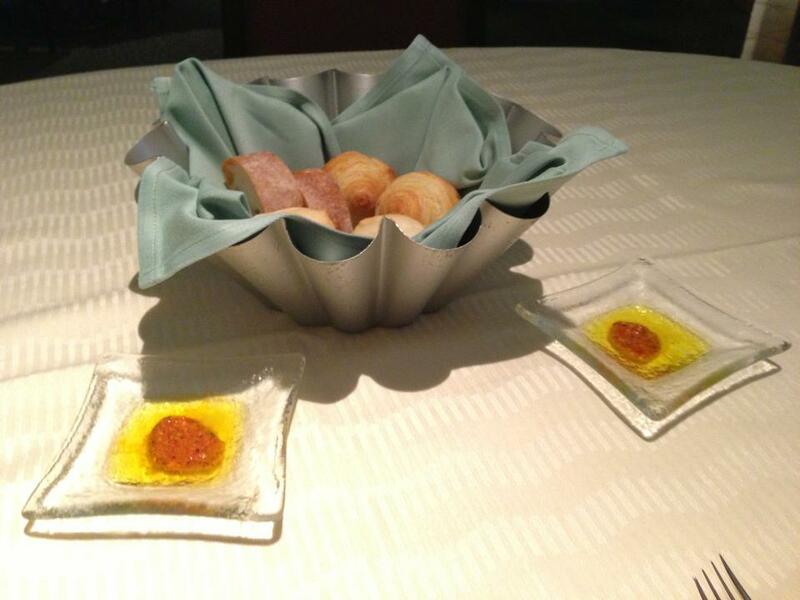 The buffet is more reasonably priced – check out Disney Travel Babble’s review. Would I recommend Oceano’s course menus? 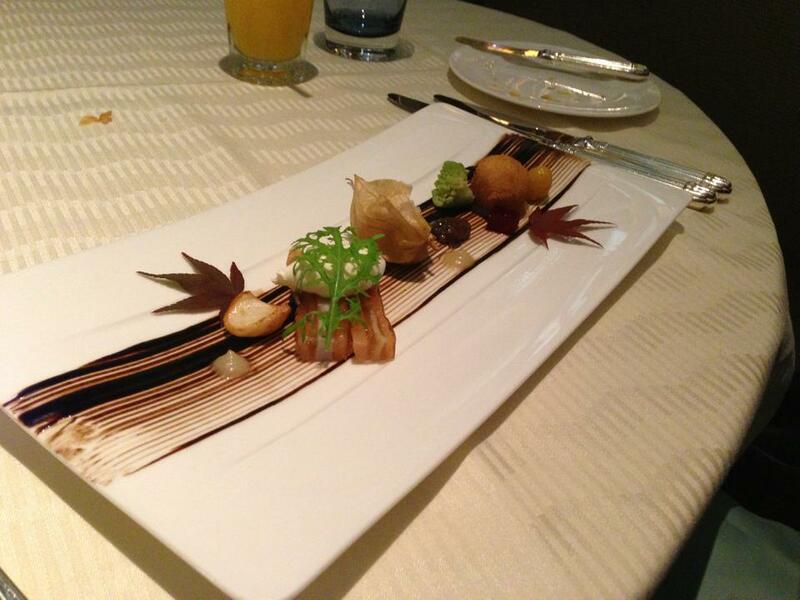 If you’re looking for an ultra-fancy fine dining experience at TDR, then possibly (for my partner and I, it was as a once off, and we certainly enjoyed it). If, on the other hand, you’re looking for value for money, I’d suggest looking into a buffet or one of the more reasonably priced restaurants (my personal favourite being Ristorante di Canaletto at Disneysea – and the Blue Bayou at Disneyland is also very popular). 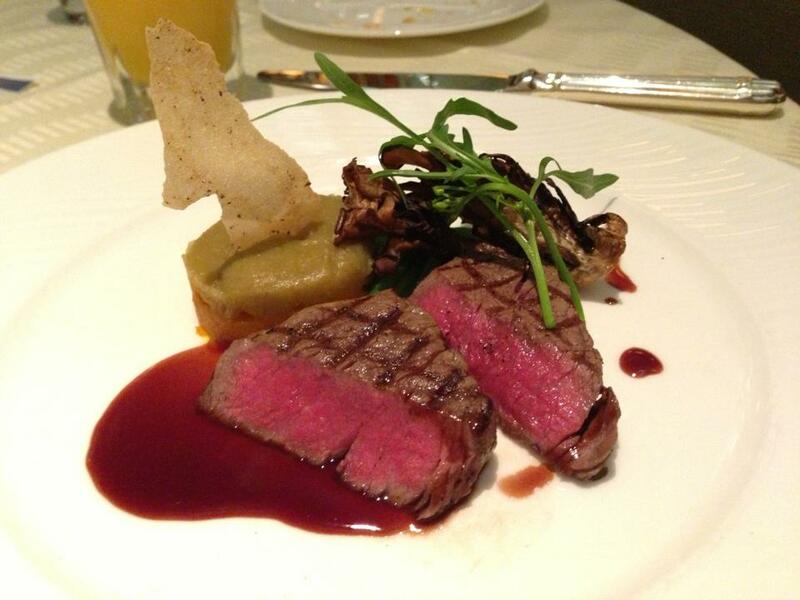 Another great place for a course menu which slightly is less costly than Oceano, is Magellan’s, also at Disneysea.